Degenerative disc disease is not a “disease,” rather, it is a term used to describe changes to the spinal discs caused by aging or excessive wear and tear. This condition can occur anywhere along the spinal column, but it most commonly affects the lower back. 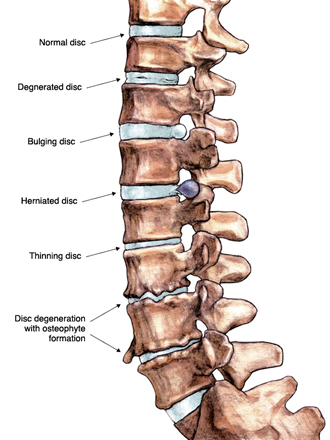 When discs deteriorate, their ability to absorb shock and cushion the spine is compromised. Because discs have a unique biology and limited blood supply, once an injury occurs, the disc cannot repair itself. Degenerative disc disease causes discs to dry out, lose height, and become stiff. When disc height is lost, nerve impingement, adjacent bone and joint inflammation, and varying degrees of pain can occur. Should the disc become torn or damaged, the jelly-like material in the center can leak out onto nearby nerves, causing inflammation and pain. Microscopic tears in the disc can also irritate the nerves in the annulus (the thick fibrous ring surrounding the disc). discs lose water with age, reducing the distance between the vertebrae. This collapse of the cushioning between spinal bones places stress on the annulus. Conservative treatment consisting of bed rest or restricted activity may be prescribed for mild pain. Anti-inflammatory medications, physical therapy, and/or epidural steroid injections are often recommended for treatment of short-term moderate pain. Should your condition cause considerable pain or disability, Dr. Stieber can explain the various surgical solutions that may be appropriate for your condition. Diagnostic tests may include CT scan, MRI, myelogram, or discography. Although there is no guarantee that surgery will help in every case, the majority of patients suffering from symptoms of degenerative disc disease can obtain relief from surgical intervention.